Rep. Jim Banks (R., Ind.) introduced legislation on Wednesday that would bolster school choice among military families, aiming to lessen the strain of frequent moves. The Education Savings Accounts for Military Families Act would allow members of the armed forces with dependent children the opportunity to create education savings accounts to be used to pay for private school tuition, textbooks, online courses, tutoring, and other associated costs. The accounts would be funded by setting aside money that already goes to K-12 educational institutions through the Federal Impact Aid program. The program provides assistance to school districts that lose out on revenue because of tax-exempt federal property, such as military bases and installations, in their jurisdictions. The bill aims to address the educational inequities that plague military families, who are often forced to move across geographic boundaries when members are transferred from one military base to another. Banks, a father of three and supply officer in the U.S. Navy Reserve who recently returned from a deployment to Afghanistan, said that education savings accounts will allow members of the armed services the ability to focus on their missions rather than worry about their children's education. "Expanding educational opportunities for military-dependent children will give parents who serve the peace of mind to focus on their missions," Banks said. "Portability is key for students who are often required to move because of a change in a parent’s military assignment. The flexibility in this legislation will allow military families the freedom to tailor their children’s education to best fit individual needs and maximize academic achievement." There are about 1.82 million children with parents who are either on active duty or in the reserves, according to the Department of Defense. 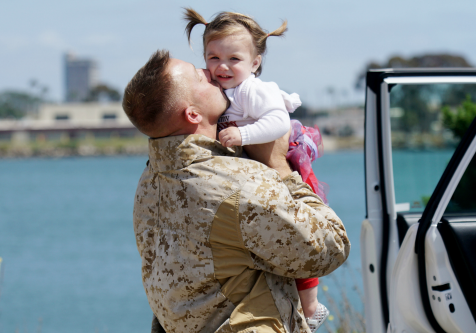 Creating educational savings accounts has proven to be popular among military families. A survey released in October by EdChoice showed 72 percent of active duty members, military spouses, and veterans support the measure. Data provided by the Department of Defense Education Activity, a civilian agency within the Defense Department that manages schools and curriculum for military children in the United States and overseas, found that the average child in a military family will move six to nine times throughout the length of their school career. That frequency is on average three times greater than in the case of children in nonmilitary families. Banks argues that education savings accounts will not only benefit military families by expanding educational opportunities, but will also benefit the military as a whole. The legislation comes at a time when the United States has one of the smallest active duty forces—1,340,533 troops as of 2015—since 2001. Furthermore, since the draft was abolished in 1973, the average ages for military officers and enlisted personnel have climbed. The average age in 2015 was 34.5 years for officers and 27 for enlisted troops. Those numbers, coupled with statistics that show women on average have their first child at 26.3 years of age and 30.9 years of age for men, paint the picture of an older military force with more familial attachments than past generations. Banks says the low enrollment numbers are partially the result of individuals being forced to choose between serving their country and providing a stable and quality education for their children. Banks' assertion is backed up by a 2017 survey conducted by Military Times, which found that 35 percent of respondents list dissatisfaction with their children's educational opportunities as "a significant factor" in deciding whether to continue with military service. "The men and women who serve our country in uniform make sacrifices daily, but the education of their children should not be one of them," Banks said. "My legislation will help improve military readiness by boosting recruitment and retention of our nation’s best and brightest." This entry was posted in Issues and tagged Education, Military, School Choice. Bookmark the permalink.